Mommy's Favorite Things: New Year, New Gear Giveaway! Win $970 in prizes!!! New Year, New Gear Giveaway! Win $970 in prizes!!! Booty Goo: Booty Goo has a soothing blend of high quality ingredients that not only treats diaper rash, it also prevents future rashes. You won’t find another over the counter formulation of ointment quite like Booty Goo. It’s fast acting formula works by sealing the skin to protect against moisture while providing a clean environment to encourage new skin cell growth. With its soothing blend of high quality ingredients, Booty Goo not only treats diaper rash, but prevents future rashes from occurring. This awesome diaper ointment is available at your local Walgreens and Booty Goo wants to be sure you have plenty diapers to go along with the six tubes of ointment they're providing... so they're also giving away a $500 Walgreens gift card! Step2: The Step2 Company, headquartered in Streetsboro, Ohio, is the largest American manufacturer of preschool and toddler toys and the world's largest rotational molder of plastics. They strive to be the leading innovator of children's products that build imaginations and enrich the family's celebration of childhood. Step2 products are made to last and will hold up despite the beating that children tend to give everything they come in contact with. Their toys are colorful, fun, and encourage imaginative play. Not only does Step2 create fantastic toys, like their Push Around Buggy, they also have children's furniture and storage solution ideas like the Step2 Fun Time Room Organizer. You can never have enough toy storage when you have kids! One lucky person is going to win BOTH of these great items! Fairhaven Health: The mission of Fairhaven Health is to develop products designed to safely and naturally promote fertility, pregnancy wellness, and breastfeeding success. From preconception through pregnancy and nursing, Fairhaven Health is there - every step of the way - to provide clinically-proven products to help you along your journey to and through parenthood. To help breastfeeding mothers, Fairhaven Health is offering 3 amazing products to our winner! The Milkies Milk-Saver will allow you to save every drop of breast milk that you make - you know it's a precious commodity! The patented Milk-Saver collects your leaking breast milk as you nurse - allowing you to store extra breast milk effortlessly with each feeding. To store your milk, they're also giving away a Milkies Milk Tray that freezes milk into convenient, 1-ounce sticks that fit into all bottle sizes. They're made from PET plastic, a food-safe plastic that contains no bisphenol-A (BPA), phthalates, or dyes. The winner will also receive Milkies Freeze, the patent pending "first in, first out" breast milk storage system that fits in your freezer. You'll simply collect your precious breast milk in any milk storage bag, then once frozen, slip the bag into the Freeze storage system through the slot at the top, and the bag will fall to the bottom of the storage container. When you need to thaw a bag of breast milk to feed to your little one, pull a bag out from the bottom of the Freeze - that way you are sure to use the oldest milk first! Dynamic Duo Media: Thrifty Nifty Mommy and Viva Veltoro have joined forces to create Dynamic Duo Media, a meeting point between brands and bloggers. They'll be coordinating BIG giveaway events (like this one!) and are donating a few parenting must-have prizes to sweeten the pot for our lucky winner! A video monitor is so very helpful for keeping an eye on your little one, and you'll love the Summer Infant Baby Zoom Wi-Fi Video Monitor and Internet Viewing System (valued at over $200). Our lucky winner will also win a Boba Wrap in Brown for comfortable babywearing for newborns to infants up to 35 pounds. 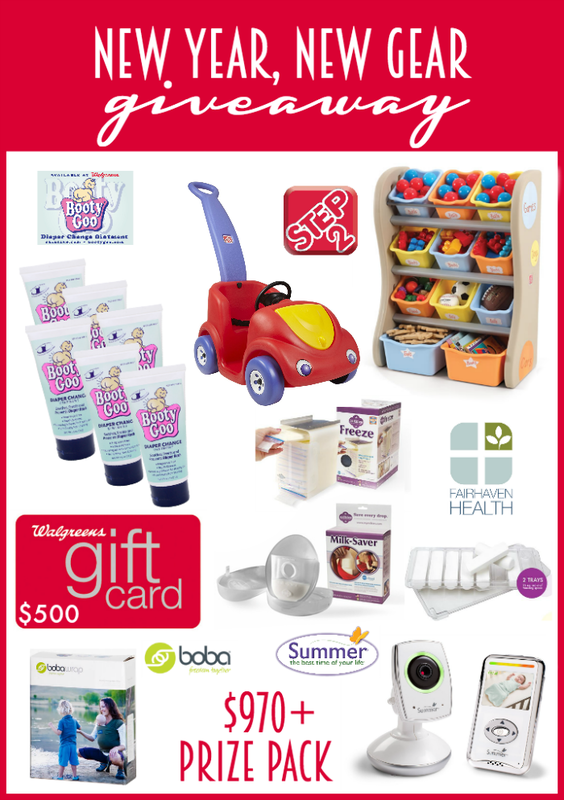 One lucky person will win this $900+ prize package from Booty Goo, Step2, Fairhaven Health, and Dynamic Duo Media! Open to the US only, ages 18 and up. Ends 1/28/15 at 11:59 PM EST.